Light, Gooey, Triple Chocolate Muffins that Everyone Will Love! 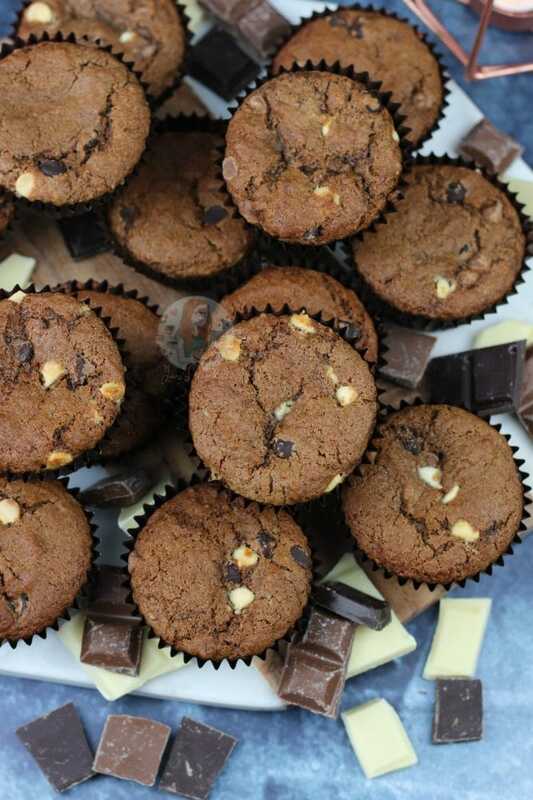 Absolute and utter heaven for me is a good triple chocolate muffin. You can buy them in every supermarket, coffee shop and bakery – yet they are so easy to bake at home! Another favourite of mine is lemon & blueberry but that is for another day. 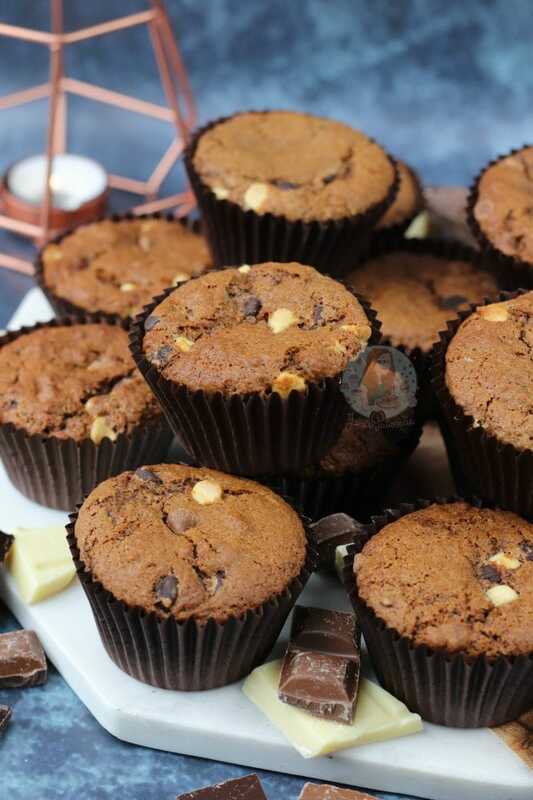 These muffins are beautiful when fresh out of the oven and still warm, or even when they have cooled down and are the day after baking. They are truly irresistible! 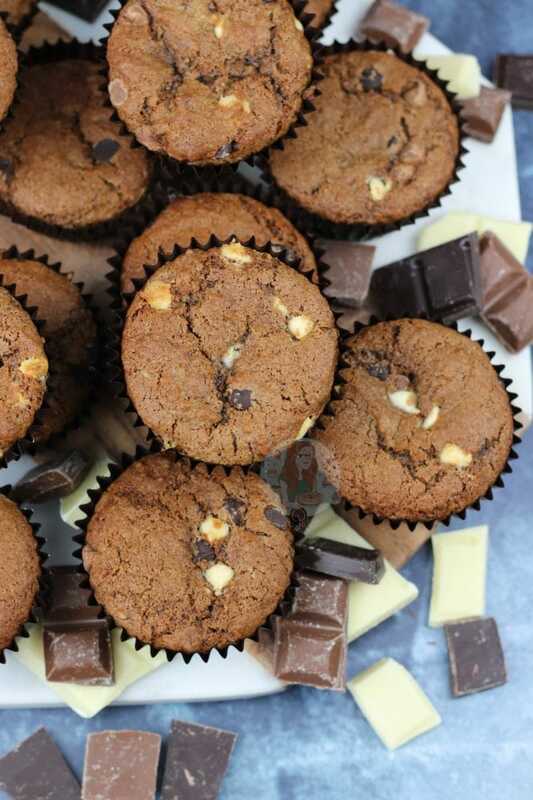 I have tried and tested many a triple chocolate muffin recipe, but honestly I believe this one is the best I have found and created – the sponge is so light and fluffy yet chocolatey from all of the chocolate chips. You don’t feel weighed down after eating one as they are that light! However, this does often lead to eating more than you potentially should… but who cares really. Muffins are good for the soul. They’re good for the mind. The recipe does seem to have a lot of ingredients in it, but to be honest its not thaaaaat many… but it is worth it. The Sour Cream makes it really, along with the bicarbonate of soda. They react together in such a way that its a dreamy muffin. I’m not 100% on the science behind it, but it just works so well. You could easily just use one type of sugar in comparison to two, but I just love the combination. Using all light brown sugar would make the muffins slightly more caramel flavoured, and just caster sugar would make them lighter. It’s one of those types of recipes where you can really use whatever sugar you want, but I would still recommend using the entire amount. I know some people like to try and reduce the sugar in recipes, which you can feel free to do… but sometimes I think it can affect the bake a little too much. For the base of the brownie, its very important like my brownie recipes, to use Dark Chocolate, and not milk. You CAN’T TASTE THAT ITS DARK CHOCOLATE, and I don’t know how many times I have to write it. 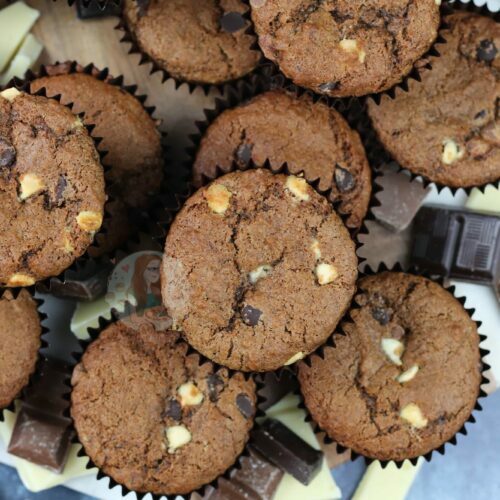 A lot of people ask if they can change it, but if you don’t use dark chocolate for the base, you will use the fudgieness that makes the muffins, or brownies, what they are. 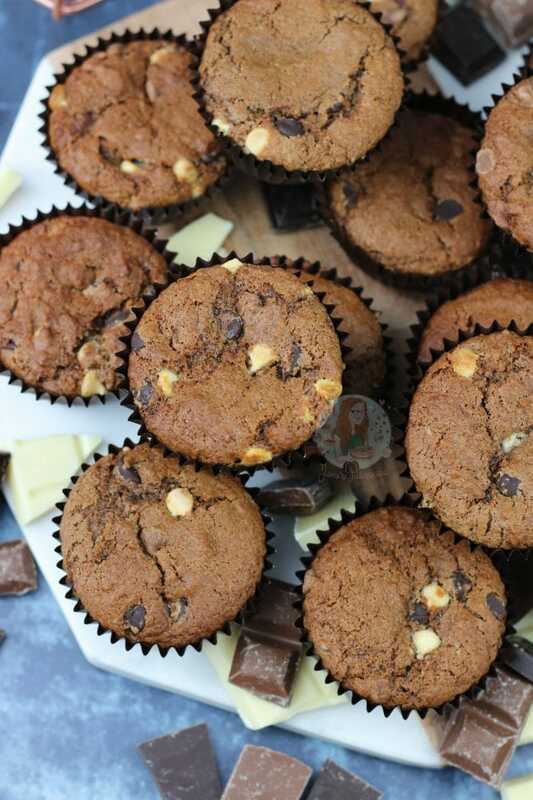 With all the other ingredients that are put into the muffins, it will lighten it anyway so there is nothing to worry about. 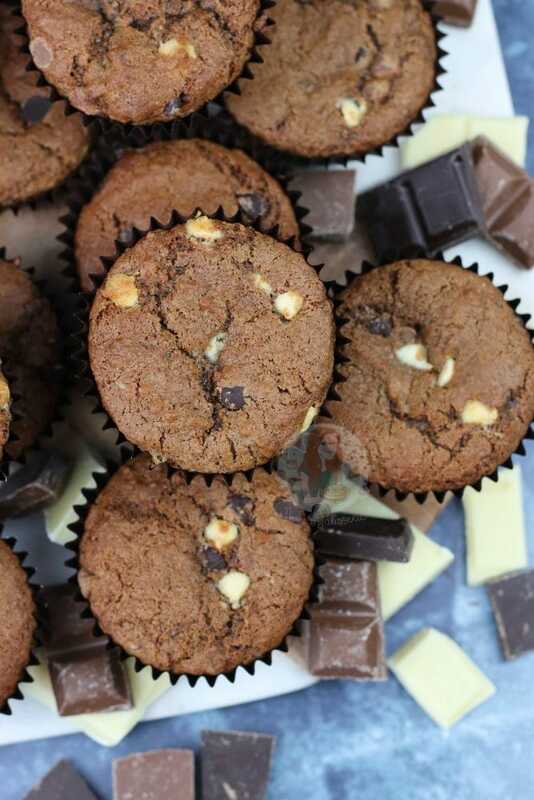 I then add in white chocolate chips, and milk chocolate chips, and it creates the wonderful Triple Chocolate heaven. You could easily use chunks of chocolate in comparison to chips, and it will make larger pockets of chocolate which when gooey is heeeeaven… but thats up to you! 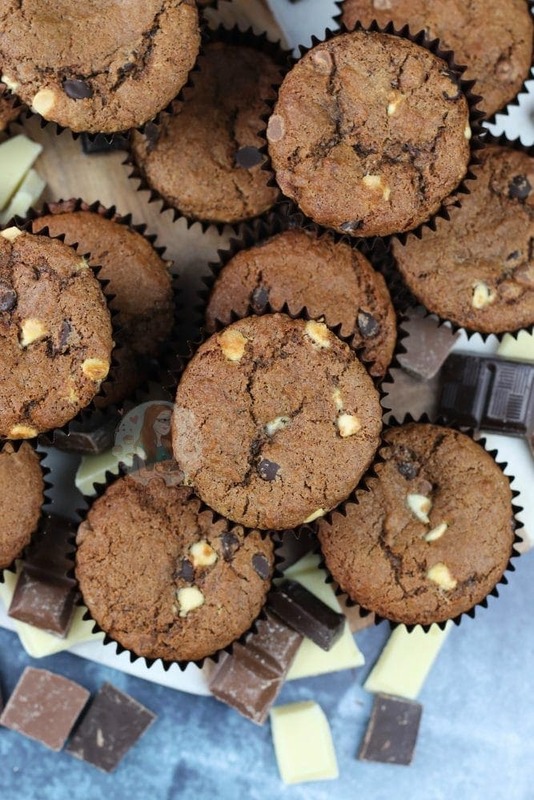 You could also easily use a flavoured chocolate of sorts, or even peanut butter chips! The possibilities are endless. ENJOY! Preheat your oven to 180C/160C Fan, and line a muffin tray or two with cases. Melt the Dark Chocolate with the Butter ever a pan of summering water, or in the microwave on short bursts. Leave to the side to cool whilst you do the rest. Mix the Caster Sugar, the Light Brown Sugar, the Flour, Bicarbonate of Soda and Baking Powder into a large bowl, and whisk till evenly distributed. In a separate bowl, mix the Soured Cream with the Egg. It might look a little funky, but roll with it. Pour the Egg Mixture, and the Chocolate mixture into the dry ingredients, and combine in as few stirs as possible. Add the chocolate chips in, and fold again. Spoon the mixture into the cases evenly, and bake in the oven for 20 minutes or so. Once baked, leave to cool slightly and then gobble up. ENJOY! P.s. These are INCREDIBLY addictive. You have been warned. Older Next post: Pesto-Cheese Straws! Newer Previous post: Ham, Leek & Mushroom Quiche! Jane, thanks for this wonderful recipe. Will definitely try it soon ! One question, can I freeze these cupcakes? and for how long? thanks ! Yeah you can! And I believe I read somewhere 3 months? But I have never personally frozen them or cakes so I usually freeze for a month! You had me at “triple chocolate” 🙂 Just in time for Valentine’s day! Ah always a winner 😉 they’re my partners favourites too so Im baking some for him for valentines too! Haha! It’s okay!! I’m glad you liked it!